HTC Evo 3D Smartphone and â€œHTC Evo View 4G Android tabletâ€ will be available on the network of Sprint from June 24, 2011. The HTC Evo 3D Smartphone has been announced by HTC and is Americaâ€™s first 4G phone that comes with 3D QHD display. It looks like the earlier EVO 4G. The HTC Evo 3D smartphone is equipped with 1.2 GHz dual-core Qualcomm snapdragon processor, android 2.3 gingerbread OS along with the latest version of HTC sense. HTC Sense includes Friend Stream that integrates Twitter, Facebook and other networking tools. There is 2GB RAM and the internal memory is 4GB. This smartphone sports 4.3 inch QHD touchscreen (960*540) and enables 3D viewing without any glasses. It comes with dual 5 megapixel camera and a 1.3 megapixel front camera, DLNA streaming, GPS/AGPS, Bluetooth and WIFI 802.11b/g/n. 2D videos can be captured at 1080p full HD resolution and 3D videos at 720p. GoogleTM Mobiel services are also included along with Google MapsTM, Google SearchTM, YouTubeTM, Google TalkTM and can be synchronized with Google CalendarTM. It also allows access to Google Goggles for searching pictures rather than words. WiMax 4D Network by Sprint is compatible with the new HTC Evo and it also supports 3G/4G mobile hotspot where eight WIFI enabled devices can be run simultaneously. It also enables access to android market that contains plethora of applications. The HTC Evo 3D is priced at $200 and it comes with a 2 year contract with Sprint. HTC Evo View 4G is a 7 inches touchscreen display (1024*600) pixels android tablet running on 1.5 GHz Qualcomm snapdragon processor. This tablet features 5 megapixel camera, 1.3 front megapixel camera, GPS, WIFI, 32GB internal memory, 3G/4G mobile hotspot capability, 4000 mAh battery, 1GB RAM, 3.5 mm audio jack and Bluetooth 3.0. It can also be connected to the external HDTV for the better experience of viewing HD videos. HTC Evo View 4G Android tablet is the brother of HTC Flyer and the only difference is of new black color scheme and the 4G/3G wireless radios in the HTC Evo View. There is latest version of HTC Sense and optional pen support. It is based on HTC scribe technology and enables 3G support via EVDO Rev A and 3G/4G support via WiMAX along with integrated android market support. Installed Google applications like GTalk, voice, maps, gmail and YouTube are included in HTC EVO View 4G. There are sprint applications like Sprint Football Live, Sprint Navigation, Sprint Family Locator, Sprint Mobile Wallet, Sprint Zone, Blockbuster on Demand and NASCAR Sprint Cup Mobile. 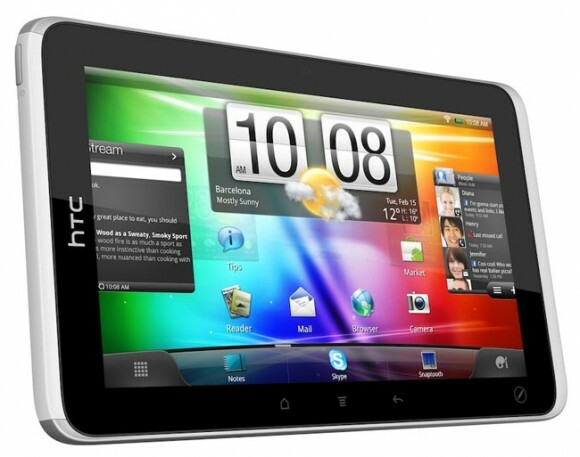 The HTC Evo View 4G Android tablet is priced at $400 and comes with a 2 year contract with Sprint.